Electric propulsion system manufacturer Torqeedo has been selected to provide the auxiliary propulsion system for Queen Elizabeth II’s row-barge, Gloriana. The company was approached in 2016 and recommendations were given to supply twin Torqeedo Deep Blue 40 Saildrive motors along with two pairs of battery packs for the vessel. 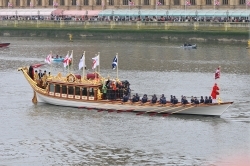 The new system was installed in time to meet Gloriana’s spring programme of events.